Usage: Take 1 to 3 capsules per day, preferably on an empty stomach, or as directed by your qualified health consultant. Jarrow FORMULAS L-Lysine 500 is the hydrochloride (HCl) form of L-Lysine, which is twice as stable as the monochloride form. 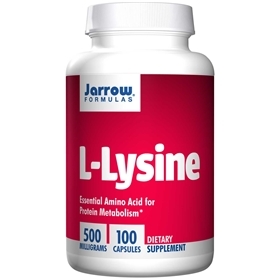 625 mg of L-Lysine HCl yields 500 mg of elemental L-Lysine.